Hosted by JustMe on 2016-06-01 is flagged as Explicit and is released under a CC-BY-SA license. Hey. It's MeToo here again. On this episode, were diverging from my last podcast of coffee and switching topics to, wait for it. Wait for it. BEER. Now, you might think to yourself, "What the heck! Beer?" I know. I know. It's so plebeian, right? Well. I too, use to think like that. What with the shades of Budweiser, Michelob, Iron Horse, Iroquois, Genesee, etc... All squaw piss. Right? I was raised on wines & cocktails. But, over recent years, especially after listening to many of you guys' podcast on beer-making and drinking, I became interested in wanting to try some of these artisan beers you all have spoken of. But, being overseas in a foreign country, my chances of such are like a snowball's chance in hell. Or so I thought. Then came one night when I was on my way to teach a class at one of the local universities, and passed by a newly opened bar with the humorous name of "Nobody Knows Bar." Where, when I glanced in the window and to my amazement, were many of the very beers you all had been talking so much about. Wow! Here was my chance to partake. So, I went to class and afterwards stopped in to the bar. So, I tried a beer. It just happened to be an IPA. Now, don't get me wrong. 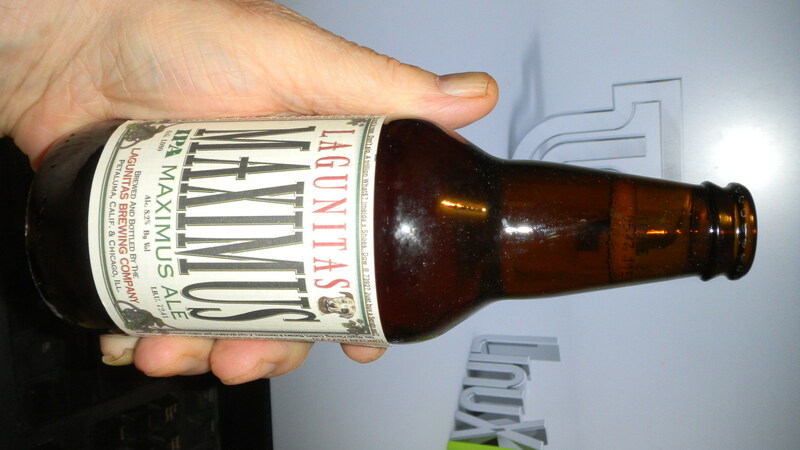 Many, many years ago I had tried an IPA and found it far from my liking. So, my first choice wouldn't have been an IPA normally. Again you ask, "Why did you choose an IPA this time?" Well, the reason was bartender recommended it. And again to my amazement (to coin a phrase), it was great. I guess the reason for enjoying it over before is that, as like everyone, my taste buds had changed. And truthfully speaking, I've come to like IPAs over many others. So, to no longer digress. Let me tell you what I chose and my opinions on the beer. The beer? A 12oz. 8.2% Alc. 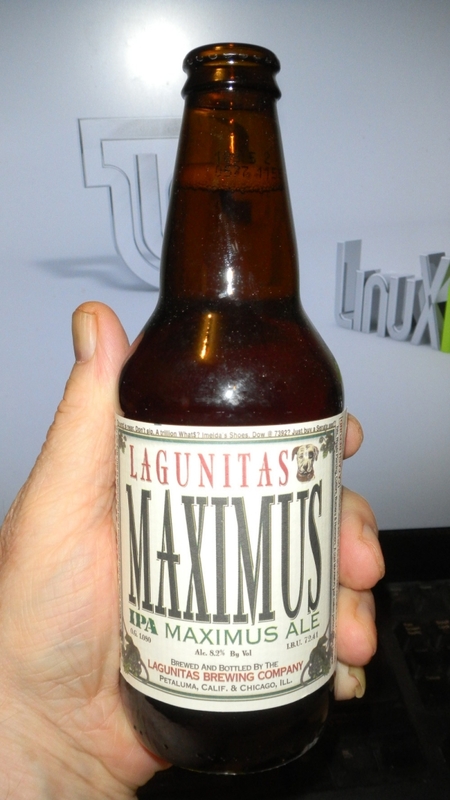 by vol., glass bottled Lagunitas Brewery's Lagunitas Unlimited Release Maximus IPA Maximus Ale. I love the labeling. It reads: "Life is uncertain. Don't dip." Also, "If some is good, more is better." And one final one, "Instant gratification isn't fast enough." What a lark! Enough diddle dallying. On to the tasting: The nose on this beer is crisp and light. The first mouthing brings a floral, fruity semi-sweet taste. The fruitiness continues into the aftertaste with an added semi-dryness. And yet, despite the alcohol content, doesn't ring your clock. The longer after flavor is strongest on the underside of the back of the tongue. Very pleasant. So. There you have it. My first beer tasting. I hope you found it telling. And maybe you too will try a bottle. I highly recommend it. I will continue these tasting over the course of time. Now don't get me wrong. I'm no sot. And I still like my coffees, but I have now found a new "like" and it's artisan beers. Until next time. This is MeToo signing out and wishing you happy trails and happy beers.